Jed Shafer Reviews The Wrestler - WrestleCrap - The Very Worst of Pro Wrestling! A human being could run out of adjectives in describing the excellence that is The Wrestler. Every bit of hype that all us internet wrestling fans have read, yeah, it’s all deserved. If I just took off the self-editor, I could write a Re-Writing The Book-length review of The Wrestler. RD’s glowing review of the movie is almost 100% spot-on. But I have to disagree with RD on one tiny, eensy, weensy little fact. It’s not a wrestling movie. Yes, wrestling drives the movie. There are three or four “matches” that take up a bit of time; we see wrestlers discussing match specifics in the back, and wrestlers getting medical attention afterwards (bring a barf bag for the CZW scene). But the director wasn’t trying to craft a love-letter to the business here or do a news-magazine-style expose. Here’s the big secret about the movie: it could be about any profession where age determines your ability to execute the job. It could be about a quarterback who comes back for one more season, despite throwing like a toddler and having knees made of pipe cleaners. Or a power forward with bad knees and failing eyesight. Or, hell, a chess player who is going senile. The wrestling is secondary. What this movie is about is an internal power struggle: Randy “The Ram” Robinson, one-time king of the wrestling world, has lost to the only opponent none of us can defeat, Time. He still craves the glory, the adulation, the crowd response … but he knows what it has cost him, and what is at stake if he keeps chasing what he can no longer catch. The industry has thrown him aside, even if he hasn’t done the same. The movie is about his being torn between these warring factions, his heart and his mind. 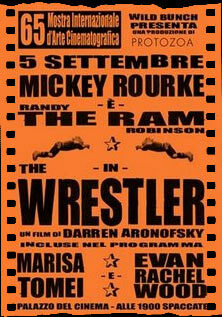 Just about everyone involved hit a home run here; Mickey Rourke is The Ram. Like RD said, he isn’t an actor playing a part. He disappears into the role entirely. Ditto Marisa Tomei, someone I didn’t think could play such a role, but does so with perfect pitch. And Darren Aronofsky, the director, has to be praised for his brilliant directive style; instead of using slick, hi-pro-glo HD cameras, he uses low-fi cameras, making the picture look a tad grainy (and no steady-cam either), which give the movie a documentary feel, which helps the world feel more real. The only person I thought who fell down on the job was Evan Rachel Wood, who plays The Ram’s daughter; I just didn’t think she was very good in her role. But it’s all of 10 minutes of screen time, and Rourke does the heavy-lifting in their scenes anyway. Now, yes, the wrestling might put people off who either don’t care about wrestling, or are outright haters. I tried to talk it up to my mother-in-law, and she shrugged, despite me selling the story of it. Some of the backstage stuff (the drugs, the CZW match with Necro Butcher) might militarize them in their hatred. Really, the dark side of the biz is dark, and it’s hard to accept and set aside if you’re not a fan … but it isn’t the point of the movie; that’s just window dressing. Anybody who focuses on the drugs or the blading or whatnot and derides the movie for being a “wrestling movie” isn’t seeing the forest for the trees. If you can get someone to be open-minded and look at the movie as a character study, they’ll see a truly touching, poignant, tragic movie. Every wrestling fan should feel compelled to see this movie. You owe it to yourself … and you owe it to all the real-life Rams in the business. But don’t be afraid to take that wrestling-hating girlfriend or wife. She may not acquire a love for wrestling from it … but I’ll bet ya she’ll cry just the same.